Bright colored Meenakari work peacock will be a center of attraction, for it's shine and choice of colors used on it.. It is made of metal, light weight and non breakable. This item in Indian Idols & Statues category was first added to our catalog on 07-08-2018. Buy Jaipuri Meenawork Metal Peacock Home Showpiece, sold & shipped by Yashaswini Kalagrah where you can shop online for Unique Artisan Crafted Indian Handicraft. 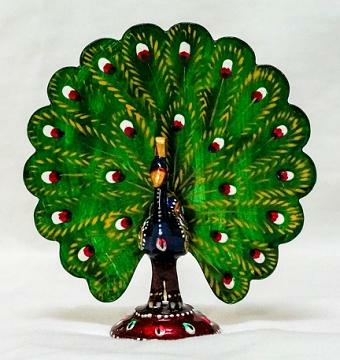 This Idols & Statues collection has been tagged as Peacock Bird, Meena, Bird, Figurine, Decoratives, Table, Artifact, Colorful Statue, Metal, Gifts, Traditional, Indian Handicraft, Jaipuri Art, Rajasthani Painting.